A distinctive feature of the Thames and Severn Canal is the roundhouse. These were all constructed in 1790, the year following the canal's opening, and served as lengthsman's cottages. They were constructed of stone with a plaster or stucco finish. The roundhouse at Chalford has since had this removed. The roundhouses came in two basic forms. One with a conventional pitched conical roof, the other with an unusual inverted (upside-down) conical roof. The inverted roof was lead-lined and believed to have been used to collect rain water which was channelled down to an underground storage tank used to supply the roundhouse. Chalford & Cerney Wick have a conventional pitched roof, while the roundhouses at Coates, Marston Meysey & Inglesham have the inverted roof. 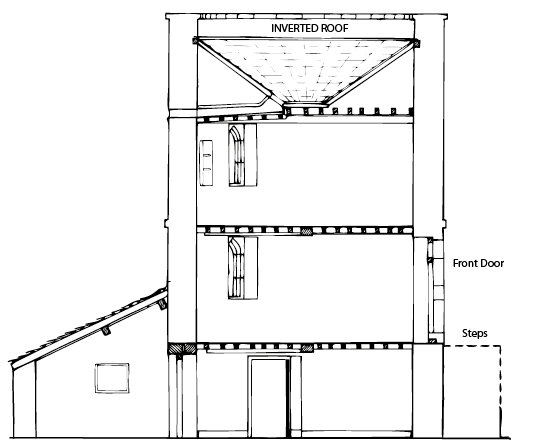 Section through Coates Roundhouse showing the inverted conical roof. The roundhouses are on three floors, with a single room on each floor. Originally the lowest would have been used as a stable and was accessible only from the outside. These appear to have been converted into living accommodation some time later. The first floor was the living room with the front door opening directly into it. The second floor being the bedroom. The lean-to scullery shown in the Coates Roundhouse drawing above was a later addition. There would have been no bathroom when the roundhouses were built, and the toilet ('privy') would have been outside, as was the practise at that time. The walls of the roundhouses are 20 inches (0.5m) thick and the diameter of each room is 16 feet 10 inches (5.1m). The curve was slightly flattened on one side to accommodate a kitchen range and the chimney. Please note all roundhouses and adjacent buildings are on private property. Only the roundhouses at Coates and Chalford can be viewed close-up.